Ironically, Benn is the son of the late Tony Benn, the former secretary of state for energy under prime minister James Callaghan, and a one-time deputy leadership candidate in 1981. Long a member of Labour’s hard left, the adjective ‘Bennite’ for decades described the party’s supposedly unelectable left-wing fringe, mentoring socialists like Jeremy Corbyn, who recently upset Labour’s moderates to win the Labour leadership in September, and John McDonnell, who now serves as shadow chancellor. Even after standing down from Parliament in 2001, Tony Benn was an outspoken critic of the British participation in the US-led invasion of Iraq in 2003, serving in the mid-2000s as the leader of the ‘Stop the War’ coalition that Corbyn would later head. Like father, like son? 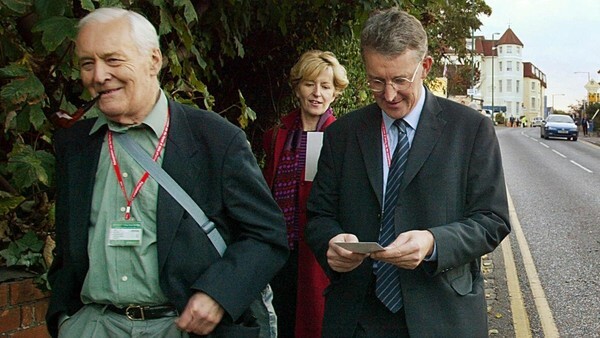 Tony Benn (left, here in 2003) was the charismatic voice of Labour’s hard left, even as son Hilary Benn (right) rose through the New Labour ranks. It was a superb speech, and there’s anecdotal evidence that Benn’s impassioned argument pushed the number of Labour MPs voting with British prime minister David Cameron’s government even higher — to 66, a group that includes former home secretary Alan Johnson, leadership contender and former shadow home secretary Yvette Cooper, military veteran (and possible future leadership contender) Dan Jarvis, former shadow business secretary Chuka Umunna, former interim Labour leader Harriet Harman and former foreign secretary Margaret Beckett. As a party we have always been defined by our internationalism. We believe we have a responsibility one to another. We never have – and we never should – walk by on the other side of the road. And we are here faced by fascists. Not just their calculated brutality, but their belief that they are superior to every single one of us in this chamber tonight, and all of the people that we represent. They hold us in contempt. They hold our values in contempt. They hold our belief in tolerance and decency in contempt. They hold our democracy, the means by which we will make our decision tonight, in contempt. And what we know about fascists is that they need to be defeated. And it is why, as we have heard tonight, socialists and trade unionists and others joined the International Brigade in the 1930s to fight against Franco. It’s why this entire House stood up against Hitler and Mussolini. It is why our party has always stood up against the denial of human rights and for justice. And my view, Mr Speaker, is that we must now confront this evil. It is now time for us to do our bit in Syria. And that is why I ask my colleagues to vote for the motion tonight. The speech, indeed, is worth watching in full. Benn entered the House of Commons in 1999, winning a by-election in Leeds Central, and he rose steadily through the ranks, though far to the right of his outspoken father. A New Labour stalwart, Benn supported former prime minister Tony Blair’s invasion in Iraq as well as the 2011 push to topple Muammar Gaddafi in Libya (although he allegedly pushed Ed Miliband to oppose airstrikes against Syrian president Bashar al-Assad in September 2013). Throughout the New Labour era, Benn rose steadily through the ranks, first as the secretary of state for international development from 2003 to 2007. Though he lost a bid to become Labour’s deputy leader in 2007, her served as secretary of state for environment, food and rural affairs under Gordon Brown, then as shadow minister for communities and local government in Miliband’s shadow cabinet. Though he backed Andy Burnham over Corbyn in this summer’s leadership contest, Corbyn promoted Benn as his shadow foreign secretary, notwithstanding some strong differences between the two on foreign policy. Just days after Corbyn’s election, Benn nearly single-handedly forced the new Labour leader to confirm that he would support continued EU membership in the forthcoming 2017 referendum, despite Corbyn’s grumbling about the EU push for austerity policies. Corbyn, in the 1975 referendum, voted to leave what was then the European Economic Community. In the four decades since Harold Wilson’s government, however, Labour has moved firmly into the pro-Europe column, and moderates like Benn are worried that Corbyn will reverse Labour’s steadfastly pro-European bona fides. Most recently, he forced Corbyn and his anti-war allies into allowing a free vote among Labour’s MPs on Syrian airstrikes. Corbyn retreated from his prior position after Benn made it clear that he would have to leave the shadow cabinet if Corbyn demanded that all Labour MPs oppose the Syria measure. Though Benn’s speech Wednesday night earned him the enmity, perhaps for good, of the anti-war left, he’s now suddenly become the frontrunner to become Labour’s next leader if, as many people believe, Corbyn will eventually be forced out. Many on the left, inside and outside of Labour, argued that Benn was a disgrace to his father and the ‘Bennite’ legacy, and former Scottish first minister Alex Salmond, who now leads the 57-strong parliamentary caucus of the Scottish National Party (SNP), scoffed that Benn’s father would be ‘birling in his grave’ to hear his son’s pro-interventionist speech. Indeed, many anti-war advocates are circulating a short video of Tony Benn from 1998 giving an impassioned speech against airstrikes in Iraq, as a younger (still bearded) Corbyn looks on from behind. On Wednesday night, however, Corbyn looked on from behind Hilary Benn with a grim face — he almost seemed to wince as his shadow foreign secretary stole the show. For now, Corbyn is still heading the party that’s still doing surprisingly well in the polls for such a supposedly toxic leader. Corbyn’s call for a ‘new politics’ and open debate leads naturally to the kind of disagreements within Labour that will surface from time to time — and that may even allow the party to sit on both sides of key policy debates. Benn has downplayed speculation that he even wants to be Labour’s leader and, even if New Labourites forced a coup against Corbyn, there’s every reason to believe Labour’s furious rank-and-file would just restore Corbyn to the leadership. Overshadowed by his father, competent but underwhelming as a minister and shadow minister, high-minded and ascetic in his habits, Benn had seemed set to go through a political life without leaving a great mark. Now he has done so. 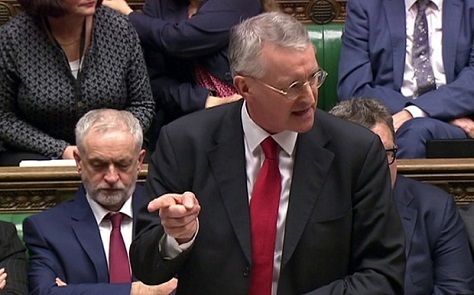 If his father, in Harold Wilson’s words, immatured with age, Hilary Benn has now done the opposite. Whether you agree with his speech or whether you don’t, he has risen to the occasion and redefined himself. He has proved himself when it mattered. In the end, that’s enough.